In spite of significant rain events–and even some flooding–in the arid Southwest, water conservation is still being promoted in many places. Mandatory watering restrictions remain in place in Texas despite torrential rains and flooding. In California, drought conditions are still in full force. Heavy fines kick in if restrictions are violated. Many homes and businesses now have limited lawns and gardens as a result. With the potentially high cost for an automatic irrigation system—in the thousands of dollars—is it worthwhile to invest in an automated irrigation system or the redesign of an existing system? Automated irrigation systems, commonly referred to as sprinkler systems, can take the guesswork and most of the hard work out of watering. They can even water more efficiently than the old hose-and-sprinkler method, possibly reducing water use and your water bill. But they can end up wasting water and money as well as even damaging your landscape if not properly designed and installed. Improvements in these systems–including improved sprinkler head design, rain sensors, and moisture sensors–reduce potential water waste. Couple all this with automatic drip irrigation, an approach to watering that is on the rise, and now you’re looking at a sophisticated yet effective automated watering system that can more accurately meet very specific watering needs. But someone has to be the brains behind the programmable controller that allows your system to run automatically while keeping you in compliance with watering restrictions in your area. Furthermore, no single irrigation system fits all landscapes. The type and placement of sprinkler heads in each irrigation zone within a yard should be selected for the type of lawn or plants that will reside in that zone. And the controller should be set to water according to what’s in that zone and how well (or not) the soil drains. Unless you’re a licensed irrigator, hire a reputable, professional, licensed irrigation contractor to design your irrigation system. Make sure the system includes a quality programmable controller, a rain sensor, and possibly a soil moisture sensor. Program the controller correctly for each zone and adjust it as conditions change, e.g., change in seasons, change in plant types, increase or decrease in lawn or planting area size or shape, etc. Have your system audited periodically and reset the controller accordingly. And while you’re at it, review how much grass seed, fertilizer, lime you’re using or estimate much you need. Consider drip irrigation for small yards or for planting beds that have a variety of plants. Compared to sprinklers, this approach minimizes water loss due to evaporation or runoff. Consider using harvested rainwater for some of your irrigation needs. If you haven’t already installed your lawn, consider what’s the best size lawn for you. 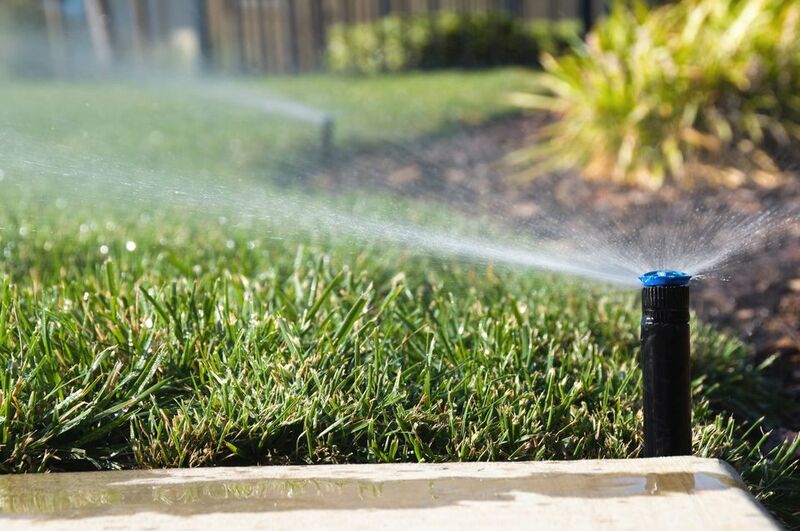 If rolling out and dragging hoses around (and then rolling them back up), and then timing and shifting sprinklers around to ensure every area is watered is not how you want to spend your time, an automated irrigation system may be just the answer! Again, unless you have a small yard and some extra helping hands for digging–along with knowledge of sprinkler head types, proper spacing, etc.–or unless you’re a licensed irrigator yourself, it is highly recommended that you hire a professional licensed irrigation contractor to design and install your system.